Bacon. Yum! Cheddar. Yes, please! Bacon and cheddar on popcorn? Whoa. Our reactions: Eyes closed in appreciation. Sighs of delight. Hands immediately dove back into the bowl for more. Even our cat couldn’t keep his paws off it. The bacon fat must have had some sort of residual life energy because we began acting like pigs. We couldn’t get the popcorn into our mouths fast enough. And I think we even snorted and squealed a little. Embarrassing, yes, but a testament to how incredible it tastes. A word of advice: Don’t eat this popcorn when you’re ravenously hungry! Why? After tasting it, you’ll try to eat it all yourself. Don’t. Restrain yourself. It doesn’t look filling–it’s only fluffy popcorn after all–but the richness of the bacon catches up to you when the rate at which you’re inhaling the popcorn slows down. And then you’ll feel slightly sick. Believe me, I’m speaking from experience. This recipe will probably be enough for 5-6 people snacking on it. It’s not meant to be a meal for two. Again, in our defense, it’s crazy good…you’ll see. The basics of this recipe were shared with me by Anthony Prontelli, Executive Chef at Rock Center Cafe in Rockefeller Center. I list a whole package of bacon in the ingredients in order to get enough bacon fat from it. If you have bacon fat lying around–starting to sound like a great idea!–you’ll only need a few slices of bacon to crumble on top at the end. I would recommend not leaving this popcorn out any longer than you would for other dishes containing bacon and cheese. Cook bacon in a large skillet until browned and crisp enough to crumble. Place slices on a plate with paper towels. 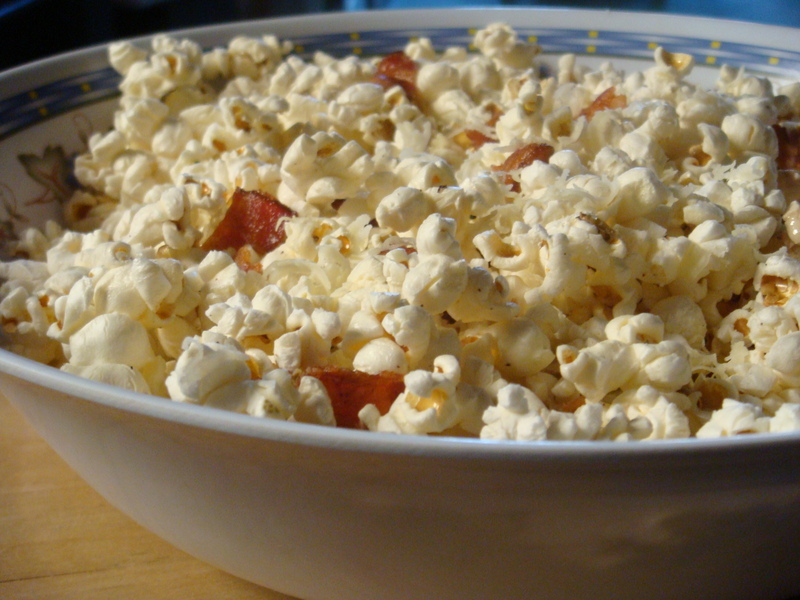 Save a few strips of bacon to crumble on top of the popcorn. Put the rest away. Drain bacon fat from skillet into a container or measuring cup for easy pouring. To pop popcorn: Pour bacon fat into a large heavy pot (one with handles on each side), only enough to coat the bottom. Reserve the rest of fat for later on in the recipe. Turn the heat to medium-high. Add popcorn kernels, shake the pot to evenly distribute, and cover. Leave the lid slightly askew to minimize condensation. Get some oven mitts ready to avoid a really toasty situation. When the kernels start popping, lift the pot about 2 inches above the flame. Shake the pot every 10 seconds (make sure you’re thumbs have a good grip on that lid!) or so until the popping is reduced from fireworks to sputtering. Place the pot on a cool burner and turn off the heat. 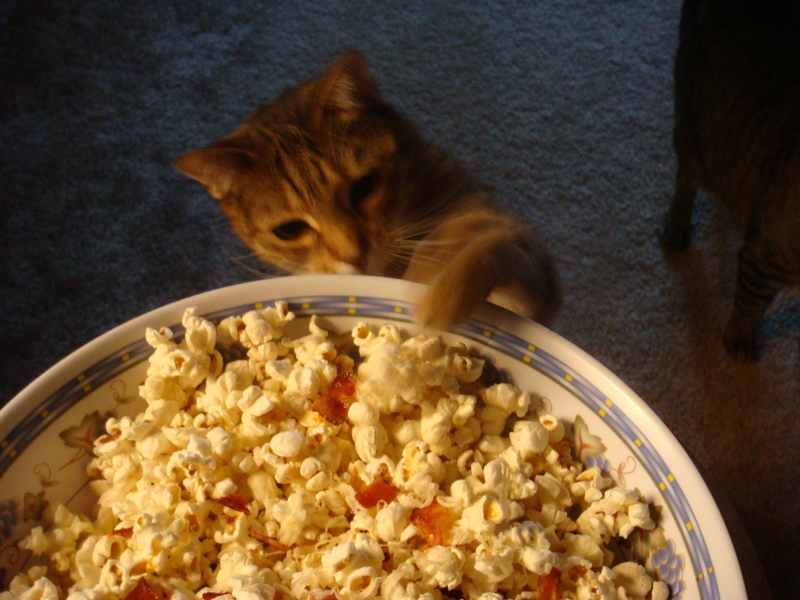 Keep the lid on until the popping stops to avoid any errant popcorn missiles to the face. Pour popcorn into a large bowl (or two) and drizzle with the remaining bacon fat. Immediately sprinkle with cheese (and sea salt, if desired) and mix thoroughly. 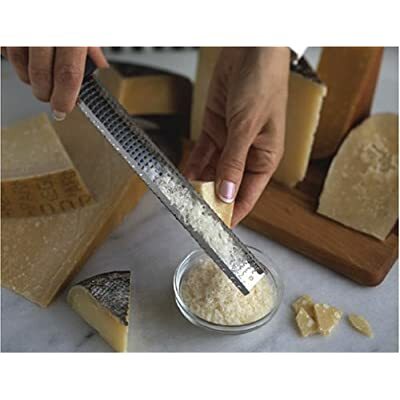 Ideally, use a microplane to grate the cheese–giving you more of a powder than small pieces–so it will incorporate better with the popcorn. Top with bacon crumbles and mix only slightly to prevent all the bits from falling to the bottom of the bowl. Try to keep the squealing to a minimum! Seriously, I am going to try this. You rock Kristin. Wow. I have to try this! It sounds incredible. Thanks Stephanie, it is! Enjoyed browsing through your recipes too!